Easily setup a gun trust that protects you, your guns, and your rights. Get NFA Firearms with convenience, privacy, and peace of mind. Our trusts are fully compliant with regulation ATF 41F. Our attorney-drafted trusts are approved by the ATF and designed to help you protect your collection. 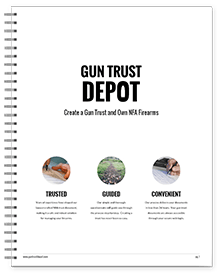 Years of experience have shaped our lawyer-crafted NFA gun trust document, making it a safe and robust solution for managing your firearms. Our simple and thorough questionnaire will guide you through the process step-by-step. Creating an NFA trust has never been so easy. Keeping your guns in a gun trust provides greater freedom when using, purchasing, and owning NFA and regular firearms. 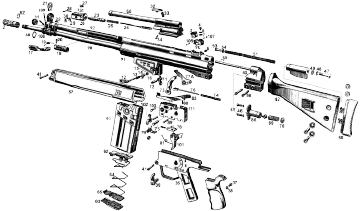 We offer the most comprehensive solution for the acquisition and management of NFA firearms. "Was looking at a short barreled rifle at my local shop and told a trust was the way to go. 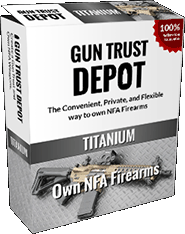 I used gun trust depot and everything was setup easy." "I made a typo while entering my information and they were able to fix it the same day. I would definitely recommend them." "Very fast! The forms were easy to follow and the instructions were clear." "I called to ask some questions they were very helpful. They got me up to speed on the trust and how to use it." "I had no idea what a trust was or how to do one. After using them setup and everything was smooth! Excellent service, no problems at all. Thank you!" "The setup was easy. I printed it out and took it to my gun shop the next day. Now waiting on the ATF." "Great service and a great value. Quick responses to my questions." "As hassle-free as you can expect. The ATF signed off!" A gun trust is a special type of trust that deals with the purchase, ownership, transfer, possession, and use of firearms. Our NFA trust documents are designed to simply and effectively deal with both regular firearms as well as the unique issues that arise from owning NFA / Title II / Class 3 firearms. Trusts improve your estate planning by managing inheritance and avoiding probate. Protect your legacy by specifying the beneficiaries of your gun collection. Assets destined for beneficiaries are protected from creditors, judgements, and bankruptcy. No limit to the number of Title II items held and managed by the trust. No expiration or annual fees associated with the maintenance or operation of the NFA trust. Protect others, such as a spouse, child or friend, from issues of constructive possession or other violations of Federal law. Allow others to be authorized users of your NFA firearms without violation of the National Firearms Act. Enter your email address and then complete our simple questionnaire. We prepare your documents and notify you when they are ready for you to review. You can then download, print, sign and notarize your new NFA trust. Once the above steps are complete, new and existing firearms (such as Class 3 / Title II) can be easily added to the gun trust. Click here to learn more about how to use your trust. Give us a Call. We love to talk about Gun Trusts! The information provided on this site is for general information purposes only. The information you obtain on this website is not, nor is it intended to be, legal advice. You should consult an attorney for advice regarding your own individual situation. We invite you to contact us and we welcome your calls. Use of this website does not create an attorney-client relationship. Copyright © 2017 Gun Trust Depot. All rights reserved.